ECOMI Collect Part 1: What is ECOMI Collect? Augmenting Reality with ECOMI Collect! The ECOMI Master Collector Program Is Here! Collectibles have existed throughout human history and today they come in many forms, such as trading cards, figurines, comics, and toys. In fact, some of the world’s tops grossing brands, such as Pokémon and Star Wars have seen a majority of their sales come from their collectible counterparts. 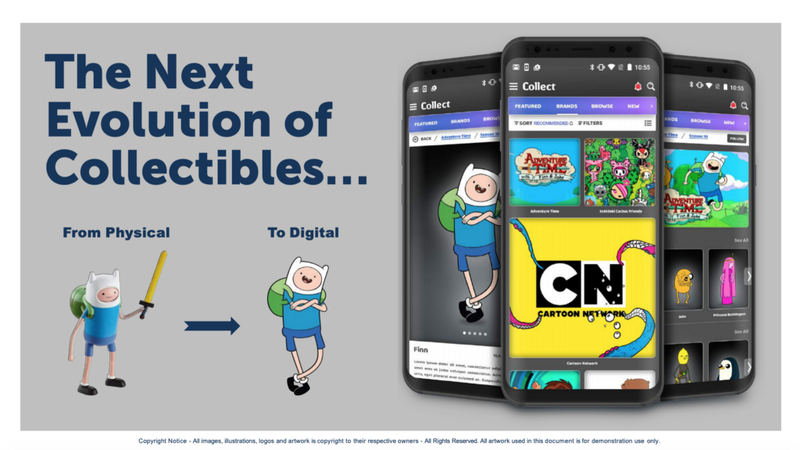 Now, with the virtual goods market/revenue expected to reach more than $100bn in the next 5 years, the collectibles industry is poised to change for the better, and through ECOMI Collect, collectibles are about to go digital! ECOMI Collect is an application that allows users to buy, sell and trade premium licensed, digital collectibles and other related virtual goods. With 15 of the worlds top brands and licenses already confirmed, and another 15 expected by the time the app launches, ECOMI Collect is primed to create an entirely new, digital experience and serve the next generation of collect-o-mania. Moreover, thanks to the experience and acumen of ECOMI CEO David Yu, and Head of Licensing acquisition Al Kahn, ECOMI will continue to capture the premium end of the digital collectibles market, covering television series, movies, animation, gaming, evergreen characters, and digital art. What Can I Do with Ecomi Collect? 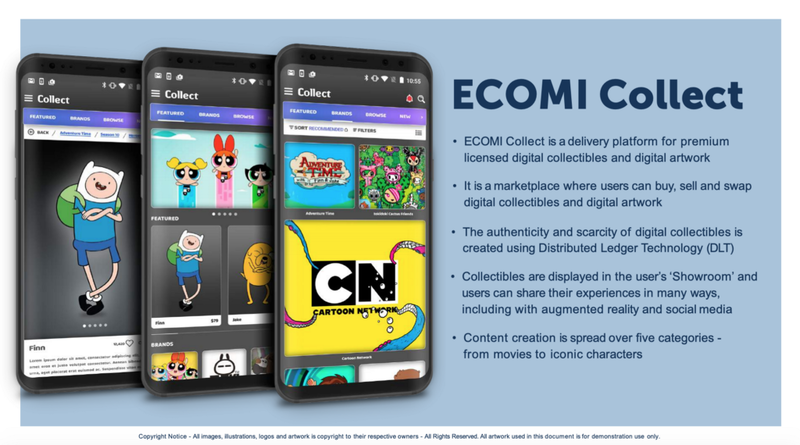 Through the ECOMI Collect app, you can browse a multitude of different brands and categories to view and purchase licensed digital collectibles, becoming the official owner. By inputting your preferences the app can also alert you to new series and sales, as well as new experiences and location-based events involving your favourite collectibles. Purchase your favourite characters and series, instantly and around the world. Build your own personal showroom, to display your digital collectibles and create custom scenes using collectible characters, Scenes and props. Share this showroom and your collection on social networks, and on your personal ‘wall’ within the ECOMI Collect app- allowing other users to comment and show their appreciation for your collection. Display and interact with your favourite collectibles in the real-world using augmented reality. Connect to our secondary marketplace, allowing you to buy, sell and trade your collectibles with other members of the ECOMI community. In phase 3 of ECOMI Collect’s development, your collectibles will be also able to interact with each other thanks to the in-app gaming capabilities! In “ECOMI Collect Part 2: How Does ECOMI Collect Work?” we’ll explore the underlying technology and capabilities of ECOMI Collect, including how the collectibles are created, how you actually purchase and own a digital collectible, and dive deeper into the combination between the app and the ECOMI Collect Digital Hardware Wallet. ECOMI’s mission is to create the world’s best platform to purchase, trade and collect premium licensed digital collectibles. With user friendly products and applications, ECOMI delivers the freedom to secure and control your digital assets, data, and cryptocurrencies from one user-friendly interface. For more information please see the ECOMI Collect Whitepaper or join the community on Telegram, Twitter and Facebook. ECOMI Collect Part 1: What is ECOMI Collect? was originally published in ECOMI on Medium, where people are continuing the conversation by highlighting and responding to this story.